It's time for another episode of 205 Live on the WWE Network! Cedric Alexander has proved that he belongs as champion and his era continues. Drew Gulak is the next challenger for the Cruiserweight Championship. These two men will clash at SummerSlam where Alexander defends his title against the conniving Gulak! Who will gain momentum for the big summer PPV? Tune in for all the details. Hit F5 to refresh the live recap! Tonight's show opens with GM Drake Maverick promising a combustible night. He announces Kalisto and Lince Dorado will take on Buddy Murphy and Tony Nese for the first time in tag team action. Also, Mustafa Ali will finally take on Hideo Itami one-on-one. Cue the opening! The fans in Orlando are still fired up after an exciting main event on SmackDown Live, and they are ready for 205 Live! The commentators of Vic Joseph, Nigel McGuinnes and Percy Watson talk about tonight's main event match that Maverick has just announced. But first, it's Party time! Gran Metalik is back with his amigos this week and will be at ringside. Dorado (with a small cast on his left hand) and Murphy start the match, Murphy tosses him to his corner, Dorado rolls around him, Murphy goes for a back body drop but Dorado counters into a sunset flip, Murphy blocks it, picks him up, Dorado slaps him on the chest, Murphy no-sells it and does a knee strike. Murphy slams his head on the turnbuckle, Nese gets tagged in, stomps on him, taunts Kalisto, picks Dorado up, Irish whip, Dorado kicks him, delivers a hurricanrana and dropkicks him. Murphy tags back in, Kalisto gets the tag, clubs him on the back, Murphy with an Irish whip, Kalisto goes for a tilt-a-whirl into a DDT, Murphy blocks it and suplexes him, but Kalisto maneuvers around him and shoves him into a corner then rolls him up into the Listo Kick followed by the basement 'rana for 2. Kalisto ends up on the apron, Nese made a blind tag at some point and pulls him off the apron after he kicked Murphy in the head. Nese rolls Kalisto back in the ring, gets a 1-count, hits forearm crossfaces then puts him in a chinlock. Murphy gets the tag, punches him, tags Nese in, Kalisto fights off both men, gets caught by Murphy and tossed backwards, and Nese hits the springboard moonsault for a near-fall. Nese with a Irish whip, running back elbow smash, Murphy tags in, stomps on him, kicks him in the back, knnedrop, glares at Dorado, covers for a 1-count then puts him in a rear chinlock. Kalisto gets to his feet, but Murphy drags him back down. Kalisto counters with a jawbreaker, hits an upkick, crawls onto the apron, fights off Nese, upkick to Murphy, springboard sunset flip for 2, crawls to his corner, sends Nese out the ring, goes for the tag but Nese pulls Dorado down. Murphy grabs Kalisto for a German suplex, bridges, gets a 2-count and tags out. Kalisto lands on his feet from a double suplex attempt, kicks Nese off of him knocking him into Murphy, and finally makes the hot tag! Dorado goes up top, lands a diving crossbody to both men, forearms and slaps to both, enziguiri to Murphy, spinning heel kick to Nese, dropsault to Murphy lands on Nese for the cover and only gets a near-fall. Nese hits a back elbow, Dorado superkicks him, hits the bronco buster, lifting inverted DDT, hooks the leg, and Murphy breaks the count. Murphy stares at Dorado, Nese clubs him from behind, Dorado ducks a double clothesline and hits the Golden Rewind to both men! Kalisto tags in, they both hit simultaneous suicide dives, throw them back in the ring, Murphy shoves Dorado out the ring, Kalisto sends Murphy out the ring, Nese blocks Solida Del Sol, Kalisto kicks him in the head, Murphy trips up Kalisto, and Nese rolls him up in a schoolboy pin for 3! WINNERS: TONY NESE and BUDDY MURPHY. McGuinness is gleeful calling them the Loser House Party. We see a tweet from Mustafa Ali recoving in a hospital bed. Ali is warming up in the locker room when Maverick shows up, says doctors told him he was overdoing it, but Ali reassures him that he's good to go. Maverick tells him he doesn't have to prove anything, but Ali again tells him he's good and he's got this. Next we see Itami warming up backstage. "Mustafa Ali, you should have shown me respect." The commentators bring up Noam Dar and we get a video package for the Scottish Supernova. He talks about his injury, being out for 10 months and realizes that it all could go at any time, so he's not taking this return/second chance for granted. That leads to Dar coming out for a match. Both of these men were involved in the Cruiserweight Classic a couple years ago. They lock up, Dar backs him into a corner, clean break, Dar puts him in a side headlock, hits a shoulder block, ducks a leapfrog, rear waistlock, Maluta grabs the ropes, clean break, Maluta kicks him in the gut, Dar avoids a kick, Maluta catches his leg and kicks him in the injured knee. Dar fights back with forearms, Maluta kicks him in the knee again, Dar reverses an Irish whip and ducks a crossbody. He connects with a combination into a European uppercut, TJP is watching the match backstage, Dar soccer kicks Maluta in the leg, hits the running kick to the face and gets the 3-count. WINNER: NOAM DAR. We go back to 205 Live last week where Jack Gallagher did a sneak attack to Cedric Alexander (after he won his match against Brian Kendrick) while Drew Gulak distracted him. 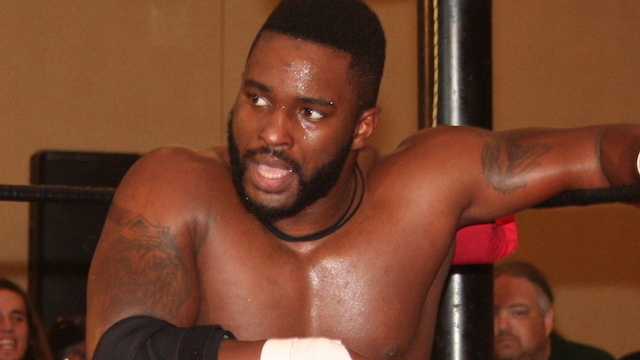 Cedric Alexander promises to take care of Gallagher next week. Gulak retorts saying that Alexander's challenge to Gallagher next week is accepted. He himself will chose to focus his mind on getting ready for his title match at SummerSlam. "I don't need anyone to do my dirty work because at SummerSlam, my plan is simple. When you step to me, you will tap out." Next week, two matches are official: Cedric Alexander will take on Gentleman Jack Gallagher, and Akira Tozawa gets his rematch against Lio Rush! The bell dings, the main event is underway, they circle around, Itami kicks around but Ali aovoid him, goes for the leg, Itami sends him to a corner, Ali floats over a running kick, ducks a head kick, lands a dropkick, covers but punches him instead. Ali ducks a backswing, puts him in a side headlock, ducks a clothesline, cartwheels to avoid a kick, backflips, catches his leg, hits a spinning heel kick, Itami rolls out thing, so Ali lands a somersault plancha! Both men are down, Ali slowly gets back up as we see an awkward landing on the replay, he throws Itami back in the ring, lands a diving crossbody from the top, and only gets a 1-count. Ali takes a minute to recover on the ropes, Itami takes advantage with a kick to the midsection, kicks him in the head, has him on the ropes and gets in his face yelling "Respect me!" Itami sends him into the ropes, Ali kicks him, Itami sends him outside, Ali pulls him out the ring, slaps him on the chest, Itami slaps him back, Ali chops him, Itami kicks him in the chest and stomps him down. The referee is up to the count of 7, Itami breaks the count, goes back on the attack, gets back in the ring, Ali grabs his leg, Itami picks him up by the hair, they battle it out on the apron, Itami dropkicks him and Ali flies backwards into the ringpost! Itami slams Ali's head on the apron, pushes his head against the LED board and kicks it, throws him back into the ring and gets a 2-count. Itami casually kicks him in the chest and shouts "Respect me! You don't respect!" He delivers a running knee to the midsection, covers, 2-count, and puts him in a rear chinlock. Ali gets to his feet, fights out of the hold, Itami sends him into a corner and hits another running knee strike. He kicks Ali in the back, covers with a foot on the chest for 2, and kicks him in the chest a couple of times. Ali rolls him up for 2, Irish whip reversed, side-steps him to the apron, kicks him in the head, slingshots back in but Itami kicks him flipping him around! Itami makes the cover and gets a near-fall, goes for his finisher, Ali blocks it and hits a pop-up dropkick. Ali makes his comeback with a couple of knock-downs, side-steps to the apron, couple of kicks to the head, slingshots back in to hit the X Factor and gets a near-fall of his own. Ali sets up for a suplex, Itami counters, kicks him in the shoulder, misses a clothesline, Ali superkicks him in the back of the head, Itami hits a back fist, and both men are down. Ali is back up, Itami ducks a swing, sends him to a corner, Ali sticks a boot up, Itami counters a tilt-a-whirl into the falcon arrow and gets 2.5! Itami sets him up on the top turnbuckle, shouts again, sets up a superplex, Ali counters into a suplex down, sunset flip, rolls through for a sit-out powerbomb and gets 2.9! Itami sends him face-first into the middle turnbuckle, sets up his finisher, Ali blocks it, Itami kicks him on the back of the head, sets up his finisher again, Ali counters again, but Itami delivers an overhead suplex into the turnbuckles, covers and gets a couple of near-falls. Itami drags him to a cormer, pulls him half off the apron, backs up, goes for the dropkick into the steps but Ali moved and hits a DIVING TORNADO DDT ON THE FLOOR! Ali throws Itami back into the ring, goes up top for the 054, pauses, loses his equilibrium, Itami trips him up onto the tree of woe, hits the Hesitation Dropkick, a second Hesitation Dropkick, and a THIRD Hesitation Dropkick, covers and gets the 1-2-3! WINNER: HIDEO ITAMI. Ali gets to his feet after the match, waves off the ref that he's okay, but then collapses. The ref calls for more help and asks Ali "What year is it?" Drake Maverick rushes the ring, calls for more help and everybody is stunned silent as Ali gets checked on. That's all for 205 Live.